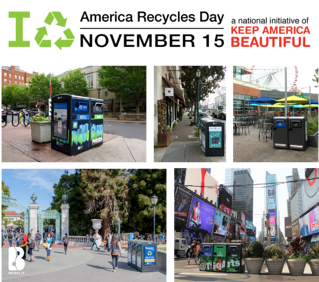 November 15th marks America Recycles Day, a Keep America Beautiful national initiative, dedicated to promoting and celebrating recycling in the United States. Nearly half of all connected Bigbelly deployments feature multiple waste streams (landfill trash, recycling, and compost) with a common goal of introducing and/or increasing public space recycling. In 2016 alone, Bigbelly’s customers with recycling and compost diverted 17,440,225 gallons (66,018,433 liters) from landfills across the world. 1. Deploy multiple waste streams at each point of disposal with clear distinction between each waste stream. If there are recycling and trash bins on opposite sides of the sidewalk or crosswalk, pedestrians are that much less likely to properly toss! 2. Use educational messaging to inform where to toss their waste. Engage the public with visuals and direction for what can be recycled in your community. Waste and recycling bins are exactly where the pedestrians are in public spaces, and their real-estate can be used to continuously educate and engage! 3. Measure and promote recycling diversion in your community. Do you know how much recycling is captured in your community? Deploy a system that enables you to measure volume of waste and recycling, capture recycling diversion, and analyze the community's overall impact on their environment thanks to sustainable practices! We are eager to celebrate our customers' recycling success in their communities, campuses, and organizations. We are proud to deliver and support the core system and infrastructure needed to enable, measure, and promote a scaled recycling program across these public spaces. Check out which communities and college campuses ranked in the Top 25 Highest Recycling & Compost Diversion Ratios for 2016. Preview: The City of Santa Clarita, CA topped the smart city charts with 66% of waste diverted from the landfill in 2016, and the University of California - Merced in CA topped the smart campus ranking with 69% of waste was diverted from the landfill! Want more ideas? Check out our blog post 14 Ways To Improve Community Recycling Rates filled with ideas for more ways to increase recycling diversion and education in your community. Join the millions of people taking the #BeRecycled Pledge on both America Recycles Day and every other day of the year. Learn more, take the recycling pledge, and find a local event to participate in America Recycles Day in your community, check out www.americarecyclesday.org.